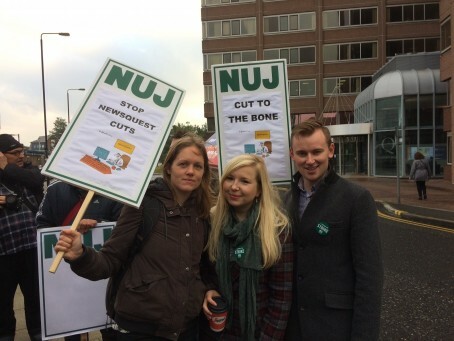 Striking journalists at Newsquest South London have received messages of support after their first day on the picket line. National Union of Journalists members at the group walked out at 9am yesterday to begin seven days of industrial action. Up to 11 jobs are set to go in South London as part of proposals which have seen 27 out of 29 staff put on notice of redundancy. Newsquest says the cutbacks are necessary to ensure its Sutton-based titles, which include the South London Guardian series and the News Shopper, have a sustainable future. In support of those striking, Public and Commercial Services union general secretary Mark Serwotka said: “We send our solidarity to the Newsquest journalists on strike to take a stand against this latest assault on local newspapers. Other NUJ chapels have also lent their support, with the union’s London Central branch donating £1,000 to a hardship fund set up for those on the picket line. Anna Wagstaff, secretary of the Oxford and District NUJ branch, said: “There is no viable future for local newspapers that cannot deliver local news. What happens in South London today will happen to the rest of us tomorrow unless we can convince management of this obvious truth. Titles affected by the action include the Guardian series in Croydon, Epsom, Kingston, Richmond, Sutton, Wandsworth and Wimbledon, the News Shopper series covering Bexley, Bromley, Dartford, Gravesend, and Greenwich, the Richmond & Twickenham Times and Surrey Comet. A Newsquest spokesman previously said: “The NUJ and its members have been made fully aware of the trading position of the South London business and the need to revisit its cost base to ensure a sustainable future. “During talks the NUJ and its members were invited to discuss, review and propose a workable structure within a reduced cost base – which they have failed to do. Sadly, as a result, talks broke down.